Modern Information Retrieval Systemsmatic h the termscontained in a user’squery with available documentsthrough the use of an index. In thisw ork, we propose a method for expanding the query with its associated terms, in order to increase the system recall. The proposed method is based on a novel fuzzy clustering of the index terms, using their common occurrence in documentsasclus tering criterion. 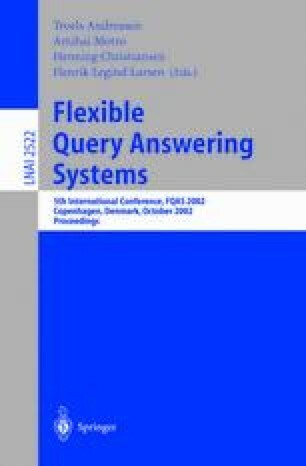 The clusters which are relevant to the termsof the query form the query context. The termsof the clustersthat belong to the context are used to expand the query. Clusters participate in the expansion according to their degree of relevance to the query. Precision of the result is thus improved. This statistical approach for query expansion is useful when no a priori semantic knowledge is available.